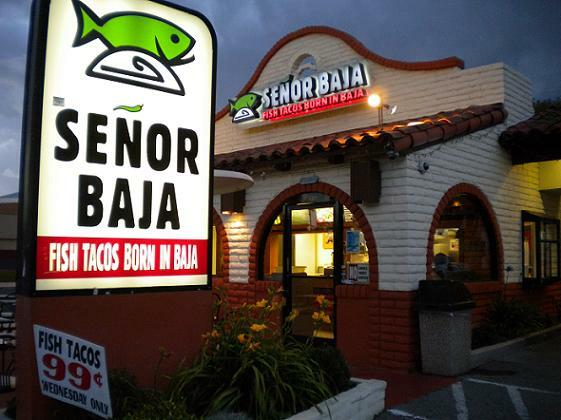 Senor Baja, which took over several El Taco Nazo locations a couple of years ago, specializes in fish tacos. 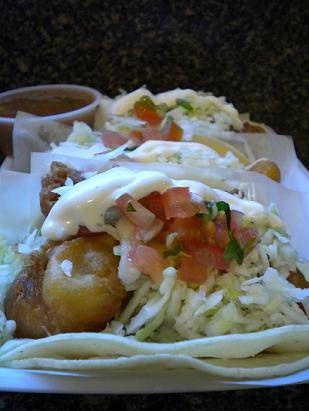 On Wednesdays, its fish tacos, normally $1.65, are only 99 cents. I went to the downtown Pomona location recently with a friend who raves about the tacos and the price. This Senor Baja is in a converted Taco Bell, constituting a distinct improvement. I got three fish tacos and a horchata for precisely $5, a cheap dinner. The tacos arrived fresh and hot. The fish was crisp, not soggy, and there was plenty of it. One taco had two pieces of fish stacked up. As my friend put it, “Sometimes when they feel like they’re not giving you enough they give you a second piece of fish.” There was probably more fish on that taco than on any three combined from Rubio’s. Even better, the tacos were delicious, perhaps the best fish tacos I’ve had. This was my first Senor Baja visit. My friend has been to most of them in the area and says the Pomona location may be the most consistent. The seating is on 13 stools inside and at tables outside. The menu has tacos, burritos, sopes and tortas, most of them fish-based. A shrimp cocktail, at $9, is the most expensive item. Here’s a link to a list of locations. I had a friend who I used to go with to the Senor Baja in Downey for Wednesday Fish Taco special. That was over 6 years ago now. My recollection is that everything I had there was excellent. Just a bit of a drive from Commerce where we worked, so it wasn’t an every day thing. Closer to home, Altacucawanda, there is a Senor Baja at Foothill and Vineyard and Foothill and Haven (previously Baja Fresh). Yes, their fish tacos are some of if not the best around but you must try their shrimp ceviche on a tostada shell with 4 slices of avocado…the perfect complement to a hot, crispy fish taco.